Shrimp Wagon's Shrimp Scampi – make shrimp just like the shrimp wagons of Hawaii. Home » Copycat Restaurant Recipes » Shrimp Wagon’s Shrimp Scampi – make shrimp just like the shrimp wagons of Hawaii. You can make Shrimp Scampi just like the Shrimp Wagon. Thanks to EMT for this recipe. 2 pounds shrimp ; medium size(21/25 count). While garlic is being roasted, rinse shrimps in fresh water then cut along the back to the tail. Devein shrimps leaving shells and tails intact. Rinse shrimps again with fresh water and pat dry with paper towels. Place shrimps aside until ready to use. Remove skins from roasted garlic and place garlic into a blender. Add oil and salt. Puree garlic, oil, and salt until the mixture looks like wet sand. Place shrimps into a bowl and pour garlic mixture over shrimps. Coat all the shrimps with the garlic mixture. 8. Cover bowl and place in refrigerator. Allow shrimps to marinade from 6 hours to overnight. 9. When ready to cook, remove shrimps from bowl and pour garlic mixture into a deep frying pan. Heat garlic mixture on medium/high heat until puree garlic starts to brown. 11. Add shrimps. Shrimps will cook fast; approx. 3 minutes. Once cooked, remove shrimps and place on a serving dish. Spoon out puree garlic onto shrimps using a slotted spoon. You can also put roasted garlic into a bowl and puree using a stick blender. Canola oil is used because it does not coagulate in the refrigerator thus allowing the flavors to soak into the shrimps. When puree garlic starts to brown, you can add fresh minced garlic into the pan. Serve over rice. 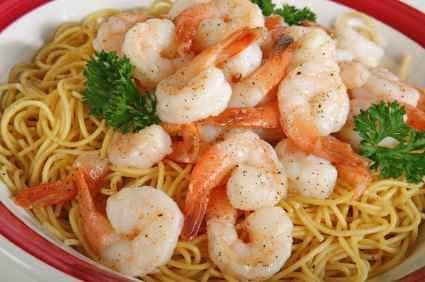 This looks delicious, I will be making this for my girlfriend she loves shrimp scampi.